Everybody thinks everything should be Free on the Internet. Well, here's my contribution. Click on the graphic to get more details. XPilot is a cool Internet based game like Thrust or Asteroids. Kill people from all over the world. 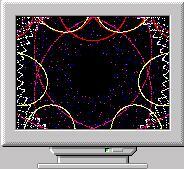 A screen saver that draws spirograph thingys.